It’s about time we start discussing the topic of negative SEO and its effect to your website business. Despite Google denies the existence of the negative SEO for the small businesses the negative SEO is alive and kicking. I think Google should start doing something about it or at least admit that we finally have an issue on our hands. Yes, Google algorithms have been fine-tuned recently to the level of the high sensitivity. However at the same time they now allow the negative SEO to affect for instance your small business website ranking and to jeopardize your website incoming web traffic. So what are options to fight negative SEO? Well …. Google does not provide very sophisticated tools to fight the negative SEO or spam linking at least in my opinion. The Download Latest Links feature of Google Webmaster Tools and Google Webmaster DISAVOW tool are locking functionality and make it difficult to provide sufficient protection from negative SEO. One of the issue with Google Download Latest Links feature is the 10-12 day delay in reporting inbound links for your website. As much as I would like to see the links going to my site I would also like to see the more recent statistics. I think a two week delay is too long and may not help prevent a disaster. The DISAVOW tool does not provide any email confirmation on receiving, processing or completion of the DISAVOW process. 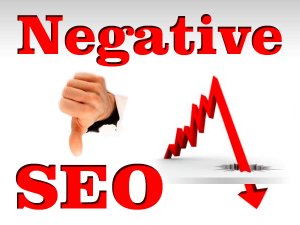 Also Google has not provided the guidelines on how to deal with negative SEO nor spam linking. Perhaps we are going to hear something soon from Google and/or Matt in particular. Will we?